But a ‘Blanquette’ is a different kind of stew. A simple explanation is that it is a white stew, meaning the meat is not browned but cooked in a white stock and thickened with a roux and egg yolks. Veal is a delicately flavoured meat which doesn’t want to be overwhelmed with other rich ingredients. A blanquette is subtle. Aromatic with herbs and deliciously creamy, it is comforting in the way a stew should be whilst somehow seeming more refined. Maybe thats because it seems more complex, or maybe just because it’s so fabulously French and has an exotic name! So if you are looking for new inspiration when it comes to your usual winter stew, look no further than this posh veal version. Packed with chunks of tender tasty veal and smothered in mellow velvety sauce, it is hearty and filling and elegant too! Make sure your veal is cut into nice medium sized chunks and remove any grizzly bits you come across. 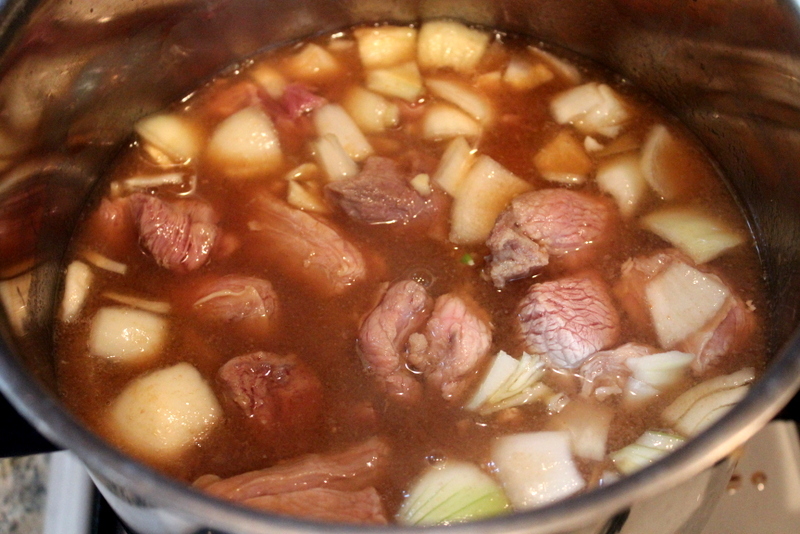 Remember the end result of this stew should be as tender and soft as can be. Place the veal chunks straight into a heavy based saucepan and cover with the stock. Throw in the chopped garlic, onions and bouquet garni. Bring to a simmer, cover and leave to cook for 50 minutes. Then add your chopped leek, celery and carrot. Re-cover and cook for another 45 minutes. In another saucepan, melt your butter and add your flour. Stir well to make a smooth paste and let it cook gently for a few minutes. Once your meat is cooked, drain the liquid into a jug, reserving the meat and vegetables of course! Make the liquid up to 500ml if there is less with boiling water. 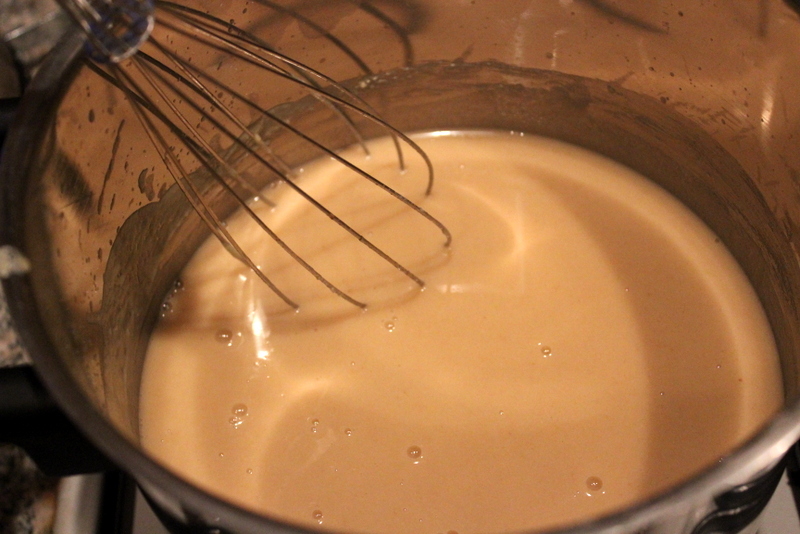 Then pour this into your roux, stirring continuously until you have a creamy smooth sauce. Meanwhile, sauté your sliced mushrooms in a small frying pan in a little butter for 5 minutes. Then remove from the heat and squeeze in the lemon juice. 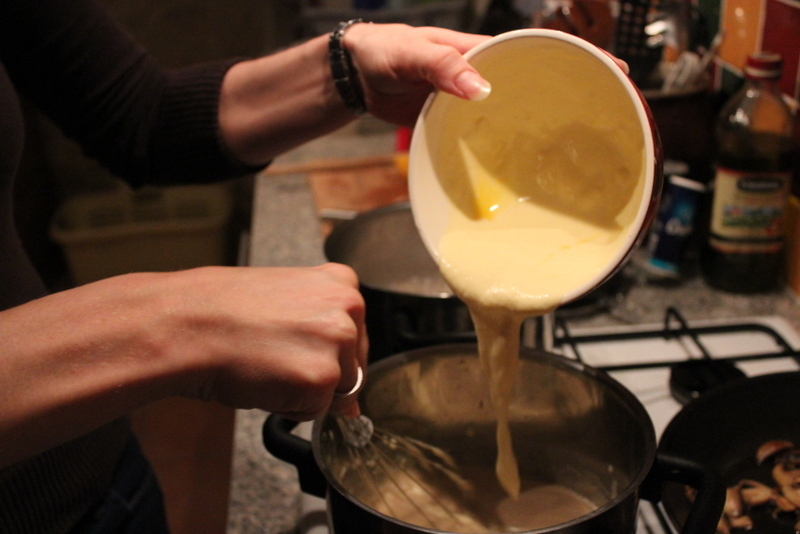 In a bowl, stir your 2 egg yolks into the cream until well mixed. With the pan off the heat, slowly pour in the egg and cream mixture into your creamy sauce, whisking all the time until you achieve a velvety creamy sauce. Then add your meat and mushrooms into the sauce and re-heat ever so gently for a few minutes just to bring back to temperature. Serve over rice with some chopped parsley. I am entering this comforting dish into a few challenges. 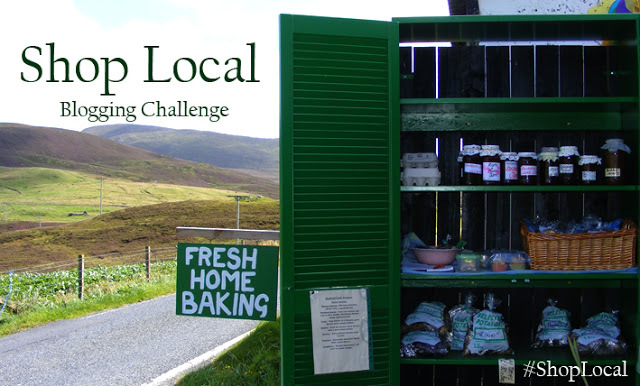 Firstly, #ShopLocal hosted by Elizabeth from Elizabeth’s Kitchen Diary as this veal came from my local farmer friends at Grasspunk. 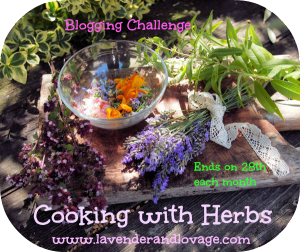 Also, I am entering into Karen’s Cooking With Herbs Challenge over on Lavender & Lovage. And last but not least, my very own Four Seasons Food Challenge with the theme ‘Food From The Heart’ as this stew was most certainly comfort food make on a cold day to make my family happy. 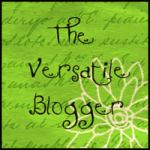 Hosted by Louisa from Eat Your Veg on alternate months. 14 Comments on "Blanquette de Veau (Creamy Veal Stew)"
Hi Anneli- Blanquette de Veau was one dish we learned at the Basic Le Cordon Bleu school. I’ve been meaning to make it again, but veal here in Australia seems to be a bit different than in France (seems like it is more like ‘plain old’ beef). At the end of the day, it’s that nice gloopy sauce that makes it taste so good! 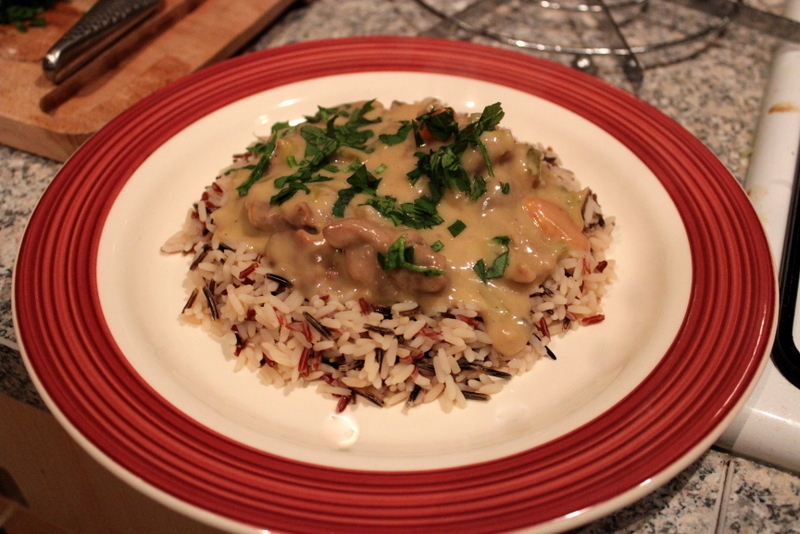 Lovely recipe Anneli, I’ve never actually made a Blanquette de Veau but have eaten a few and it’s always very delicious. And I agree, it’s definitely a more refined stew and a good deal more special than my usual chuck it all in winter one pots! Delish. This is a dish I haven’t made but would certainly be appropriate for our cold winter season. Thank you for the inspiration.